It’s not surprising to see these three replacement jobs on the list of most return for your investment given the rising perception nationwide of the value of curb appeal. If you’re considering undertaking any of these remodeling projects in 2016, now is the time to start your research and here are a few things to consider as you make your decisions. Your entry door is a key element of design so use this opportunity to capture the look you’ve dreamed of. Modernize your home with a contemporary door, add architectural detail with a craftsman style, or replicate a historical period with a traditional door. In the report, steel entry doors return the greatest value on your investment and an insulated steel door will likely save on energy costs. Wood and fiberglass doors generally cost more than a steel door and so, rank below the lower cost steel in the Report, but we’d recommend comparing the performance of different materials when you do your research. Lastly, once you’ve decided on the type of entry door you want, make sure you get the perfect fit. The most reliable method is to remove any interior or exterior trim to expose the true opening and then measure the width, height, door thickness, hinge locations, hinge width and height and handle center. Better yet, let us help before you order your door. Aesthetics, materials cost, weight and installation requirements are key considerations when researching replacement roofing. A square is the basic unit of measurement in roofing, you may win a Trivia game with this little known fact. One square is 100 square feet, making a square the equivalent of 10 feet x 10 feet. A typical two story house, 2,000 sq. ft. with gable roof will consist of less than 1,500 sq. ft. or 15 squares. The cost for your replacement roof will primarily depend on the condition of the existing roof and shape of the roof. Asphalt is the least expensive and slate (most durable) is the most expensive material, with wood, tile and cement, and metal somewhere in between. Asphalt is the most popular because it’s economical and easier to install. When choosing roofing material, the slope of your roof and the weight of the shingles are key factors to consider. Add flair to the look by adding a red metal roof over a porch like you see in the photo. When you’re ready, let us help you select the appropriate material and design for your roof style. Vinyl siding has been the siding of choice now for many years since technological advances made it both functional and stylish. Replace ugly or damaged siding and you’ll change the entire look of your home’s exterior. When replacing siding, consider adding a few architectural elements such as crown moldings, beaded soffits or decorative trim. Numerous vinyl siding styles and colors, including custom colors are available. When you’re ready for a change, visit our showroom to see and touch these beautiful products and learn about installation. Window detail creates that model home feel. 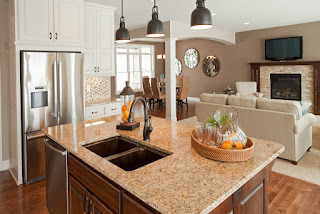 Earlier this year our blog titled “Want that model home feel? Aim high”, suggested that the very act of creating taller windows and doors in your home increases the wow factor found in model homes. The desire to create that model home feel in your own home is a sentiment many homeowners express. Another design secret is the importance of detail. Once a home’s style is determined, what makes that style come alive is attention to detail. It’s important that you take the time to select the windows, doors and other objects in your home beginning with three design principles. Stuck Windows This Winter – What you need to know about hard to open windows. If you find yourself crouched low to gravity, feet hip width apart, abs firm, elbows tucked, arms ready to lift and you’re not a sumo wrestler, you may have a problem of stuck windows. Don’t get stuck inside this winter. If you’re wrestling with old or new windows you can do something about it before winter arrives. First, understand that humidity causes wood windows to swell, accumulated dust causes tracks to increase friction, and loose or faulty tension springs fail. It’s also possible that the installation wasn’t done correctly. If the window wasn’t installed perfectly square, if too much insulating foam was compressed in the wall cavity, or if setscrews weren’t properly adjusted - your window can be hard to open. Our cities, towns and neighborhoods are increasingly noisy places to live due to the faster pace of life, proximity to highways, airports or trains, and increased density of housing. So it’s little wonder more homeowners and builders are interested in windows and window upgrades that will dampen outdoor sounds. The question is, can new windows reduce unwanted outdoor sounds from being heard inside your home? Sound travels through mechanical waves. When a plane flies over your house the sound reverberates through surrounding particles; including; gases, liquids and solids, which vibrate or collide and pass the sound energy along to our ears. The denser the medium, the slower it will travel and so, the more the sound will be absorbed before it reaches your ears. If you want to select windows that will produce a quieter home, you need to pay attention to the acoustics – the sound control of a window. Now the question is, can windows be made to be acoustically soundproof? Answer, no, however there are techniques for making windows that dampen sound? Some of the most beautiful neighborhoods around Chicago and its suburbs are the old tree lined streets of traditional homes. 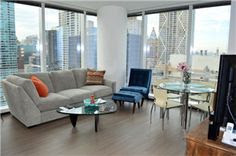 Famous for it’s historic architecture Chicago reflects the best of classic homes through the years. Prairie, craftsman, Victorian, farmhouse, brick row houses, limestone mansions – we’ve got it all. If you love the traditional styles that have defined our beautiful area, but want modern functionality – learn how you can mix traditional styles with modern products. The benefits of remodeling or building a new home using modern windows, skylights, doors, siding, sunrooms and other building products are quite simple; ease of use, better performance, lower utility costs and less maintenance. Today’s products are produced using new technologies that make life easier. For example, built in and auto controlled window treatments can be preset to open and close at optimal times. They are simple to use, while maximizing daylight and minimizing unwanted heat gain or loss. There are multi-point door locking systems that engage automatically when the door is closed. Without argument, low E dual and triple pane insulated glass lowers costs over the length of owning your home. Other improvements like insulated oversized glass, gives you more natural daylight to keep your home warm and reduces your need for electric lighting. Modern skylights with special coatings and ventilation are now built in new forms that can direct light and control ventilation in a room. Whether you purchase natural wood windows or synthetic vinyl windows, more than ever before, today’s finishes have a higher resiliency to weathering, mold or mildew. 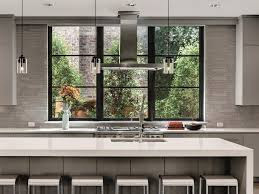 Modern windows tilt inward for easy cleaning and offer water spot resistant surfaces for skylights and hard to reach picture or awning windows. One way to combine the desire for a traditional home with an equal desire to use modern materials is by blending classic style with a few contemporary elements. Keep the traditional exterior façade, while using more contemporary materials for the interior. For example you can choose that classic red brick Georgian exterior and add more windows and glass patio doors, rather than the traditional small and sparse windows. Select traditional brick moldings made of low maintenance composites or vinyl around the windows, rather than the higher maintenance wood choice. The interior can be less traditional with an open floor plan that invites in more natural light. Create entire window walls without completely violating the traditional style of your home by using multiple French doors with glass transoms for a floor to ceiling light wall. 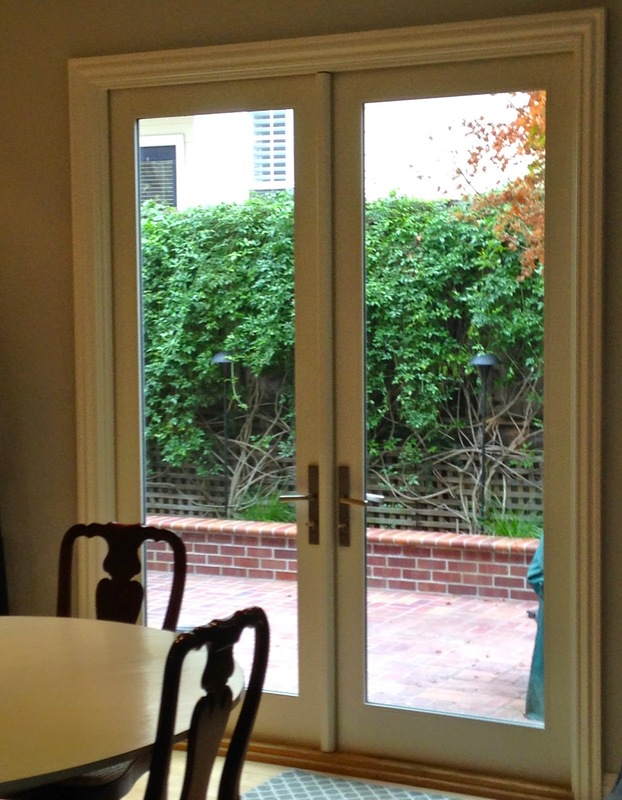 Modern folding doors are an alternative if selected in dark hardwoods for a more traditional look. And replacing stationary transoms with remote controlled awnings will help ventilate your home creating cross breezes that will cut down on energy consumption. Replacing Your Windows? Review the Advantages of Wood. The surest way to use up two idle hours in a day is to Google ‘replacement windows’. After researching replacement windows for hours at home, homeowners come into our showroom more confused than ever. The last thing Woodland Windows and Doors wants to do is to add to the confusion, so we've pledged to make the subject understandable and help you make an informed decision about the option you choose. Making the subject of replacement windows understandable begins easily enough, but informing customers about specifics that will make a difference for their application is our goal. After talking about your home, the subject of replacement windows naturally progresses to the following categories. Do you need a partial or full window replacement? What material do you prefer, wood, fiberglass, composite, vinyl or aluminum? This is the end of simple categories that make things understandable because your answer to the two questions creates a rubric cube of possibilities. Most salespeople will focus on explaining the differences between window materials, but we’re not like most because we know everything there is to know about the products available in the market. Woodland thinks it’s more helpful to focus on our customers’ home and explore the range of products that meet and exceed their expectations. Each product has unique attributes and options that go beyond the type of material, so our goal is to introduce our customers to the right products from the start. Wood replacement windows are the preferred choice if you want to preserve the original character of your home. Woodland recommends clad-wood, not all-wood replacement windows. Even when a customer wants to perfectly match a historical window, we can recommend a product such as Marvin Signature Series, which can replicate an original custom milled window. In most cases however, clad-wood, which has an exterior layer of aluminum or vinyl to protect the frame from weather and minimize maintenance, is the best premium wood replacement window. Marvin Ultimate comes in double-hung or casement styles and offers a superior clad-wood replacement window. Wood interior finish options offer six different wood species including cherry and mahogany in six different stain choices. You have other options as well, painted, primed only or clear coat. Customers who select the primed only option can have the windows finished in their own custom color. The exterior of the window features an extruded aluminum clad-wood finished in commercial-grade anodized paint that resists fading or chalking. Customers can choose from nineteen colors or order a custom color. The anodized finish is said to be as hard as diamonds and is one of the most durable finishes made. The anodizing process places the aluminum in a chemically stable and non-toxic bath. An electric current is passed through the bath, causing the surface of the aluminum to oxidize and form a stronger coating than the original aluminum surface. The result is a surface that is resistant to abrasion, erosion, and ultraviolet light degradation. Aluminum cladding can be rolled or extruded – the two are very different and Marvin Ultimate products have extruded aluminum cladding. The standard for roll-form aluminum components requires only a 0.9 mil finish thickness instead 1.2 mil coating required for extruded aluminum. Imagine a typical Midwest storm with hail and debris knocking against your windows and you’ll understand the difference in aluminum cladding. Roll-form can dent far more easily than an extruded finish, which is why Marvin stands behind a 20-year warranty against loss of adhesion, chalking or fading. The double-hung tilt-wash style allows the sashes to tilt in for easy cleaning like many new windows and, unlike most manufacturers, the Marvin Ultimate casement window can also rotate inward, making both sides of the glass washable. The sizes and styles are numerous, including multiple glass options most suitable to your home and your personal preferences. For example, Woodland most often recommends Low E1 for our northern climate because it blocks heat loss and reflects heat back into the room. Or depending on whether the window is a south wall, north wall, upstairs or downstairs, we may recommend another glazing option to take advantage of the sun’s radiant heat. Woodland also carries other recommended clad-wood replacement windows such as Marvin Integrity as a less expensive alternative to the Ultimate or Signature for a highly custom design. We can also show you a comparison of top products like Andersen 400 Series or Woodwright and Pella Proline (standard sizes only), Designer or Architectural Series. Replacing your old windows can be as fun as selecting windows for a new home. So stop Googling and come in to our showroom where you can touch and feel the products. Next week we’ll review the fiberglass replacement windows. Most people know about the National Fenestration Rating Council (NFRC) rating system and label that shows consumers how a window performs in several areas, such as, thermal insulation, solar heat gain, visible light transfer and air leakage. 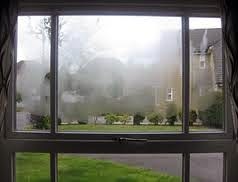 What most people don’t know is that the NFRC also rates a window’s condensation resistance (CR). While, the U-Factor, which rates thermal insulation or how well a window prevents heat from escaping, is most important. For a cold climate like Illinois, another important rating, maybe CR. Since this rating is optional for manufacturers to include on their Energy Star label, it may not be available, however it is important to consider when purchasing new or replacement windows. Condensation on your windows can be worse in winter when the outside temperature is below the dew point of the indoor air. Water or frost appears when warm moist air comes in contact with colder dry air. Maybe your windows have a single pane of glass, which provides no insulation. Since condensation is more likely to form on cold surfaces than warm surfaces, there are water droplets or ice on the glass. If this describes your windows, be aware that upgrading your windows to today’s technologies will make a significant difference. Early double-pane wood windows with aluminum spacers can experience condensation. The aluminum spacer separating the two panes of glass is very conductive, thereby transferring in the cold from the outside. 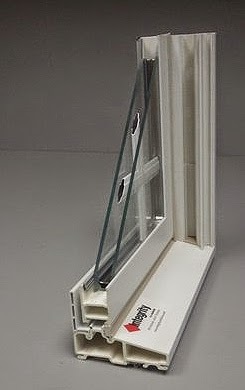 Spacers are located around the glass edges and so conduct heat from the inside pane to the outside pane. The area where the wood meets the glass can develop condensation, freeze, thaw, and eventually rot the wood. Today’s windows are engineered differently. Frankly, the most important part of the window to resist condensation is that spacer that keeps the panes of glass apart and seals in the gas. Today’s spacers are made of less conductive stainless steel, U-shaped tin steel, and foam polymers. Low-E and gas filled glass panes reduce temperature transfer between the inside and outside. Add the frame, to this list of improved materials, and you essentially have the features that are measured in the NFRC U-factor ratings. The NFRC recognizes three parts to a window: the center-of-glass, the edge-of-glass, and the frame. The lower the U-factor, the better the window is at keeping heat in – particularly important during winter’s heating season. Some condensation is expected and can result from any number of variables, including a homeowner’s lifestyle. Dryers that are not vented to the outside, gas cooking without using the vent, room humidifiers or forgetting a boiling teapot, our lifestyle choices all contribute. However, sloppy, wet, sweaty windows are unsightly and left unchecked, the constant moisture can lead to serious damage of the windows, window coverings and walls. If you’re in the market for replacement windows remember to ask about the features that contribute to condensation resistance. For example, our colder climate makes aluminum frames a poor choice, but if you must have this for your modern home make sure the window you choose has thermal breaks. Second, opt for Low-E and argon or krypton gas fills between double or triple panes. Third, ask about warm-edge spacers, which are no-metal or spacers made of less conductive metals. With so many window choices out there, it would be nice to have a simple rating system, like the U-factor to compare windows for condensation resistance. The NFRC and others, have attempted to articulate a common measurement for manufacturer’s to use, which is called the CR scale of 1-100, with a higher number representing more resistance to the formation of condensation. A single pane wood window might have a rating of 15, while a triple-pane wood window may achieve a rating of 75. A cold climate, like Illinois, ideally would opt for a rating over 50. So why aren’t window manufacturer’s required to include the CR rating on their windows? In a nutshell, while it’s a valuable metric to obtain, there are still multiple ways to measure condensation resistance and limitations to either rating method. It may come back to the homeowner’s lifestyle choices contributing to indoor condensation. For example, shades, curtains, and blinds tend to reduce the amount of airflow across the window. This allows the window to cool and increase the likelihood of condensation. Woodland Windows and Doors have done the research about condensation resistance and have discovered that a single rating probably isn’t a particularly useful number. However, selecting new or replacement windows that reduce the relative risk that you will have condensation is a very worthwhile pursuit. If you need to maintain a higher interior humidity during the winter months, for health or comfort reasons, you want to pay attention to the edge-of-glass details. Or maybe you just want to be sure you understand the important features and specifications of the windows you buy. Ask Woodland -Woodland knows. Homeowners who choose vinyl to be their favorite material for replacement windows reason from the fact that vinyl is a high quality material and very flexible when it comes to usage. With vinyl windows, regular painting is not necessary. Moreover, you only need to periodically wash the windows to keep them in good condition. Vinyl is made from Polyvinyl Chloride, which is a very efficient heat insulator. Therefore, vinyl windows will keep heat in during the winter and keep it out during the summer. This will always save you the burden of high energy bills as devices like heating and cooling systems will utilize less energy. Vinyl is cheap, yet very long lasting. Vinyl windows also come in different colors, designs, and shapes to choose from – you are not limited to just a select few colors or sizes. However, there are some downsides to this window material. For example, vinyl windows can potentially fade in extreme weather conditions, especially in too much heat. When this happens, the window must be wholly replaced because vinyl cannot be repainted. For some homeowners, wooden replacement windows are the best choice. Why? Unlike vinyl, wood can easily be shaped into various styles. Wood is also very strong and durable and can withstand adverse weather conditions. Some woods, for example Mahogany, can last for decades without rotting. Wooden windows are also good insulators, thus, they can regulate temperatures during the summer and winter to save on energy bills. Wooden windows have also got their own downsides, however, as well. Number one, they have to be painted regularly. This means an increased cost of maintenance. Number two, they are susceptible to molding which can interfere with the fiber of the wood. Lastly, wood can be affected by termites. There are also those who are of the opinion that aluminum replacement windows are the best. It is resistant to rust, making it unnecessary to do regular painting. Aluminum windows are also very easy to clean. This way, the homeowner can use his time to engage in other activities instead of spending it all with cleaning the windows. Aluminum is typically less expensive than wooden windows. The only tangible disadvantage of aluminum window is that it has low energy efficiency. It easily allows heat to pass through it. This increases energy bills as there will be a need to use HVAC systems more often. In conclusion, every homeowner must look at the disadvantages and the advantages of these three materials before choosing on the one that will best suit him or her. A pane is a framed part of a window normally fitted with a thin glass or any other transparent material. Single pane windows are very popular among those homeowners who treasure simplicity and the basics. Single window panes are very affordable, and will therefore not cause so much financial strain to those people who are operating on tight budgets. They are also very easy to repair. A sudden crack will not be too big of a deal since the replacement procedure is quite simple and very easy to understand. All you need to do is to remove the remaining pieces of glass on the broken window, replace them with a clean sheet of glass and seal it with high quality putty. Remember - this should be left to the professionals! Argon is one of the group eight elements in the periodic table. It has an atomic number of 18. Argon gas makes windows more energy efficient. Argon has a higher density when compared to that of oxygen. This means that the Argon gas between the layers of double or triple paned windows is less affected by convectional currents and drafts .The windows will therefore have a higher insulation value. This saves on the cost of energy since the homeowner will not have to spend so much on heating and air conditioning during summer and winter. Argon gas also reflects excess heat better when compared to plain air. Un-welcomed heat is inhibited from entering your home, leaving you only with the desired warmth. This is a much needed property, especially during hot weather. On the other hand, Argon gas may have adverse effect on your window panes. Argon gas will dissipate out of your window after some time; this results in its reduced efficiency. This problem can be easily taken care of by using nonmetallic spaces that seal better and will not allow your gas to escape. Argon gas replacement windows are not available at higher altitudes (i.e. at 2500 and above). Improper sealing can also cause leakage of your Argon gas. Manufacturers normally use two methods to seal gas into your replacement window panes, namely, the one-holed method and two-holed method. The former is thought to be the best as it minimizes the possibilities of the gas escaping. Windows play a key role in our homes. Windows allows fresh air, light and ventilation inside, but they are often taken for granted. Windows contribute to the general beauty of a home, thus choosing the right style that suits your house is of paramount importance. However, many homeowners often have a hard time choosing between wood, aluminum, and vinyl replacement windows. This article will address the several ways in which wood, aluminum, and vinyl are different and how they are similar. Pros: Whether you live in an old home or contemporary home, wood replacement windows offer a variety of colors, finishes, and styles to meet your specific preference or taste. Many homeowners are often tempted to opt for vinyl because of its low cost. Before you make such a decision, consider the initial cost versus long term benefits. Wood windows are more durable than vinyl and therefore provide more value for your money. Moreover, wood is an excellent insulator, making it extremely energy efficient. Cons: Wood was once an organic material. If not given proper care, it can start to rot while it is still installed in your home. You will need to keep mold and water off of your wood windows to ensure they remain in good condition. Pros: Vinyl replacement windows are made mostly of PVC (polyvinyl chloride) together with some other types of plastics. Vinyl windows do not need any staining or painting on the outside or inside of the house, eliminating the need for serious maintenance. Also, vinyl is relatively cheaper when compared to wood windows, and is a poor conductor of heat. PVC windows are the most popular replacement window options available right now. 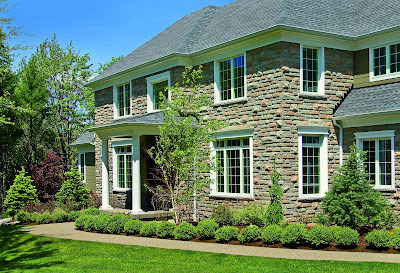 Their low maintenance requirement, high energy efficiency, durability, and low cost make them the best choice for the majority of homeowners who are shopping for replacement windows. Cons: Vinyl material may be a threat to the environment as polyvinyl chloride releases poisonous dioxin when exposed to fire. Furthermore, you cannot paint vinyl windows into the colors of your choice, thus finding the exact color that matches the style of your home may not be easy. Pros: Aluminum windows can be designed to meet or exceed energy efficiency standards. High performance aluminum replacement windows can improve energy efficiency by a large percentage. Aluminum requires less maintenance because it is resistant to corrosion and weathering, and can withstand extreme weather conditions. Additionally, aluminum can be easily manipulated into virtually any shape to meet your tastes. With an endless assortment of finishes, glass options and designs, aluminum offers a variety of possibilities from the cheap to most sophisticated window systems. Cons: The main issue with aluminum is that it doesn’t offer excellent thermal efficiency. Aluminum is a good conductor of heat, thus aluminum windows may not work marvelously in extremely hot or cold climates. A home without beautiful windows will be lifeless and dull. Your home needs a window for light, fresh air, insulation, and more. But it’s vitally important to have the best window installed in your house. About 20 to 25% of a home’s heating and cooling use attributed to doors and windows, according to the U.S. Department of Energy. Thus, you need to be very careful when choosing replacement windows. There are many aspects to be kept in mind. To get the most out of your replacement windows for your home, you need to know certain key things, and here are some of them. Replacement windows come in wood, clad wood, aluminum, vinyl, and fiberglass. Each has its own features and performs differently. Vinyl, also known as polyvinyl chloride plastic, is one of the most popular materials for replacement windows. The material is less expensive which makes it more attractive, but the minimal choice of colors makes it less versatile. Aluminum is strong and less heavy, but not very efficient. Wood windows remain the top choice for replacement. Wood is naturally beautiful and can be painted into different colors to match many home styles. However, unlike vinyl, wood require lots of maintenance. Low-E Glass (low-remittance) coatings are thin, nearly invisible, metallic oxide films placed on a glazing surface in order to minimize the U-factor by preventing heat transfer or heat flow. Coating the glass surface of a window with a Low-E Glass material and depositing coatings between the glass layers suppress heat flow through the window. Choosing Low-E Glass will help to keep your home cooler in the summer and warmer in the winter. Between the panes of double or triple paned replacement windows, an inert gas such as Krypton or Argon is placed in to improve its thermal performance. Krypton or Argon is used because the two are denser than normal air. They are harmless, have higher resistances to heat transfer than typical air, thus they are good for lowering the window’s U-Factor. Most replacement windows come in three styles: single, double, or triple pane glass windows. A single pane window is typically less expensive, but it offers little or no insulation. Double and triple pane replacement windows have layers of glass between the panes to minimize heat loss through the window. Other aspects may include cost, maintenance required, solar heat gain coefficient, and air leakage. The cost of a replacement window will depend on the design, material, and size of the window. Homeowners who view vinyl as their favorite window replacement material argue from the point that it is of good quality and is very versatile. With vinyl windows, regular painting is something not necessary. Furthermore, you only need to occasionally wash the windows to keep them in good shape. Vinyl is made from a material called Polyvinyl Chloride which is a very powerful heat insulator. Therefore, vinyl windows will keep heat in during winter and out during summer .This is what we call high energy efficiency and it will always save you the pain of high energy bills since there will be minimal usage of heating systems and air conditioners. Vinyl is cheap, yet so durable, and they also come in a variety of colors to choose from. To some home owners, wooden replacement windows are the best. Unlike vinyl, wood can easily be shaped into various designs. Wood is also arguably stronger and more durable, and can withstand extreme weather conditions. Some woods, for example Mahogany, can be last for several decades. Wooden windows are also good insulators, thus, just like vinyl, they regulate temperatures during summer and winter to save on the energy bills. There are also those who think that aluminum replacement windows are the best. It is a material that is resistant to rust, making it unnecessary to regularly paint it. Aluminum windows are very easy to clean. The homeowner can therefore use his precious time doing other activities instead of spending it all on cleaning windows. The windows are also very affordable, sometimes even cheaper than wooden windows. In conclusion, every homeowner must weigh the pros and the cons of these three materials before settling on the one he or she will best suit him or her. How do vinyl replacement windows compare with wood and aluminum windows? What is the difference between vinyl, wood, and aluminum windows? When you start to shop for new replacement windows, you might be a little confused with the many options available to choose from. It’s impossible to say one is better than the other because each of them has their own pros and cons. In this post, you will get some great information to help you compare various features of vinyl, wood, and aluminum windows. Vinyl has a nice external appearance, making it very attractive. It comes in different styles and colors. Most vinyl windows are designed to mimic the appearance of wood. Many homeowners are advised to consider the long term benefits of the window they are thinking of buying. A vinyl replacement window will look as new in the next 15 years as it did the day it was purchased. Generally, vinyl won’t scratch or fade because the color is the same throughout. It also doesn’t require maintenance. It is typically less expensive. Wood is a natural insulator making it energy efficient and one of the best options for replacement windows. Wood is also considered the most attractive material in terms of its appearance. That’s why vinyl manufacturers are working hard to imitate the look of real wood. Maintenance is one major reason many homeowners avoid wood. While newly installed wood replacement windows can look beautiful, it requires a great deal of maintenance. Aluminum materials are known for their extraordinary strength. You can paint aluminum with any color of choice. This can help to match the color of your window frames with your home. However, outer coating or paint can chip off over time, and this will expose the metal underneath. Aluminum is a good noise insulator, but quite inefficient in terms of energy saving. As always, aluminum is a good conductor of heat and cold. There are three different types of window materials available – vinyl, wood, and aluminum. When you are ready to replace your old, drafty, inefficient windows, you may need to choose one of these options. Keep reading and discover the pros and cons of each material. There are many reasons why vinyl is the most preferred replacement window option. Vinyl replacement windows are durable, aesthetically appealing, affordable and almost maintenance free. Vinyl is also known for its amazing insulating properties because it is a poor conductor of heat. For this reason, it stops heat from coming inside the house during the summer months. In the same way, it prevents cold air from coming inside during the winter months. However, not all vinyl windows are the same. You get what you pay for, goes the old saying. What are the Benefits of Argon Gas Replacement Windows? When it comes to purchasing replacement windows, one of the main concerns for most homeowners, besides the style and the design selected, is how efficient the windows are. 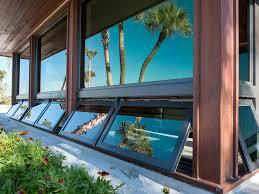 It is obvious that most people purchase replacement windows for energy saving purposes. Argon gas is used in modern replacement windows. Argon provides energy-efficiency, hence reducing heating and cooling bills. Argon is one of the noble gases that make an important part of energy efficient windows. Argon gas is about 30% heavier than air and transfers approximately 48% less heat than air. For this reason, it is used to make a barrier to prevent heat transfer. Noise, as well as heat energy, has a difficult time moving through Argon. How does vinyl vs. wood vs. aluminum replacement windows compare? To begin with, let’s admit that comparing windows is a little tricky as different people have different preferences on which windows suits their needs. However, there are those who want to replace their old windows, but are not sure which replacement window to choose. In this post, we will try to compare the three popular window materials: aluminum, vinyl and wood. After that, you’ll be able to see which material is the best choice for your home. Vinyl windows are arguably the most popular replacement windows available on the market. This is due to its low price, high performance, and availability. Vinyl windows beat their aluminum counterparts when it comes to energy efficiency. Vinyl is almost scratch-free, while aluminum is subject to scratches and dents. Maintenance is one of the major reasons many homeowners are selecting vinyl windows over wood and aluminum. While wood replacement windows would need to be stained or painted on a regular basis, vinyl windows are nearly maintenance free. They only need to be cleaned with water and soap once in a while. Vinyl windows do not require sealing or painting. The limited colors of vinyl and the fact that you cannot repaint it to your preferred color is, perhaps, the major disadvantage of these windows. Today, many replacement windows include argon gas as an insulating material which is filled in between the panes of a window. Adding argon gas in replacement windows increases the overall efficiency of your home. Technically speaking, argon gas is an odorless, colorless, invisible noble gas that occurs naturally in the atmosphere. It is non-toxic, nonflammable, and completely safe. This is an inert gas, meaning it doesn’t form true chemical compounds as opposed to other noble gasses (krypton, neon, xenon and helium). When replacing your old windows, you want to use a replacement window that will not only add curb appeal to your home, but perform its best as well. 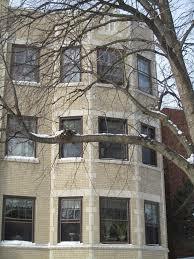 Except for single pane windows, double and triple-pane windows are good options in Hoffman Estates, Illinois. The right replacement window which is best for your home will depend on a few factors, such as aesthetic goals, energy savings, and your budget. 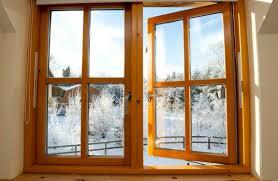 In cold climates, old windows can be a major cause of unwanted condensation issues, discomfort, and heat loss. In recent years, more sophisticated replacement windows have been developed in an effort to weed out these problems. It is now possible to minimize heat loss during the winter months and save a significant amount of money on monthly energy bills. Although replacing your windows is quite a costly investment, they are efficient and much more profitable than you can imagine. Argon gas is an odorless, tasteless and colorless gas that is extensively used in making fluorescent lights, light bulbs, photo tubes and now replacement windows. It is denser than normal air and has a very low level of chemical reactions. In other words, unlike oxygen, argon gas will not corrode or react with any type of window material. These windows include a vacuum-packed unit that is filled with argon gas between panes of glass to improve energy efficiency. Are you thinking of replacing your old windows, but do not know whether to pick wood, aluminum or vinyl windows? Are you always bombarded with commercials on the TV or flyers in your daily newspaper or just plain confused as to what's best for your home? After you know what kind of house you have and what your needs are, it is quite easy to pick the best replacement window that will be a good improvement for your home and cost effective as well. Many people are looking forward to replacing their damaged home windows this spring. They are looking for windows that perform and function better, need less maintenance, are more energy efficient and durable. Window replacement is not as expensive as some homeowners make it out to be. They really aren’t. In fact, they are a good investment in your home. While energy costs continue to rise, many homeowners are looking for ways to save money on energy. Reducing the level of energy consumption is also the responsibility of everyone as environmental problems are becoming more and more horrendous. If you are serious about saving money by cutting back on utility costs, replacing your traditional windows is of paramount importance.